“Who Am I” Produced by Stella Maris Okafor. Directed by Chimobi Nwosu / Peace Osigbe would hold it’s first World Premiere on Friday 18th August 2017 at Odeon IMAX Cinema Greenwich London. Who Am I is a movie shot in Nigeria and the United Kingdom that explores a completely different type of domestic violence and abduction. This unpredictable glamorous drama revolves around the dilemma of love, ill luck, hatred and temptation, as it highlights the emotional, physical and psychological trauma experienced during the process of love, hate and vengeance. The movie “Who am I” is star studded with top actors and actresses from Nigeria and the United Kingdom. It is an epitome of suspense and a must watch. The layout of the film, unbelievable but humorous story line will make the night a memorable one for all who attend. 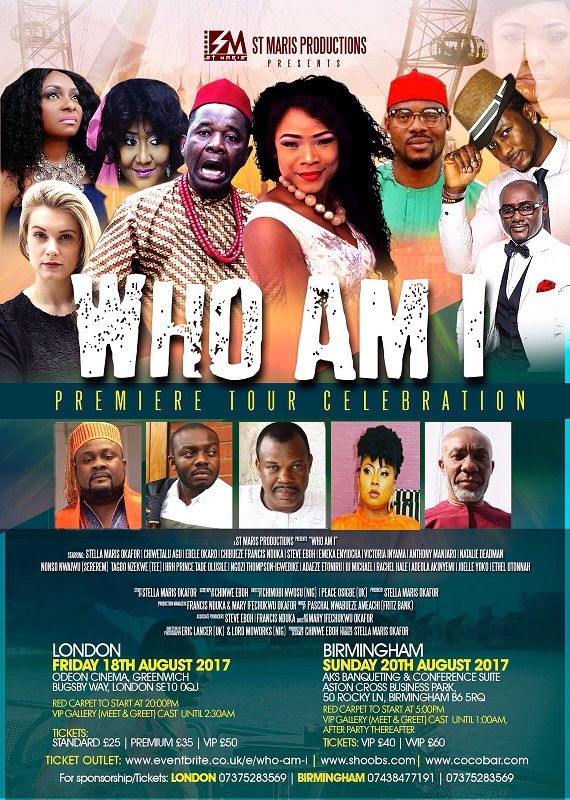 Who Am I the movie is set to be released in cinemas across the globe, starting from London, Birmingham, Nigeria then across the World.